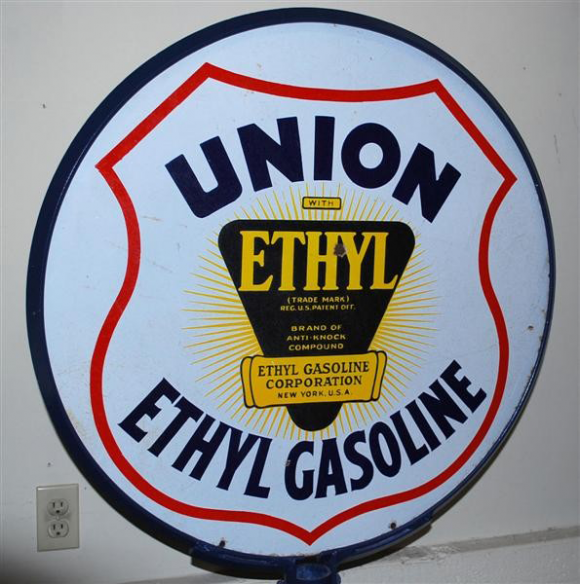 This is a round Union Ethyl Gasoline porcelain sign. This particular Union Ethyl Gasoline sign is white with red, black, and yellow print. It reads, “Union With Ethyl Brand of Antiknock Compound, Ethyl Gasoline Corporation, New York, USA, Ethyl Gasoline” and features the red outline of a shield with a black triangle in the center of the sign.